During the last two decades, the field of music production has attracted considerable interest from the academic community, more recently becoming established as an important and flourishing research discipline in its own right. Producing Music presents cutting-edge research across topics that both strengthen and broaden the range of the discipline as it currently stands. 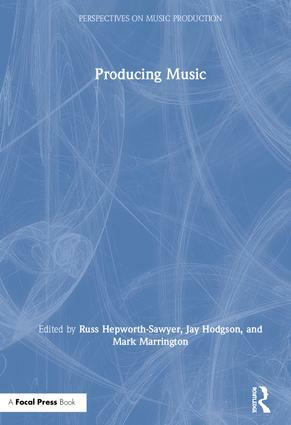 Bringing together the academic study of music production and practical techniques, this book illustrates the latest research on producing music. Focusing on areas such as genre, technology, concepts, and contexts of production, Hepworth-Sawyer, Hodgson, and Marrington have compiled key research from practitioners and academics to present a comprehensive view of how music production has established itself and changed over the years. Russ Hepworth-Sawyer started life as a sound engineer and occassional producer. He has over two decades’ experience of all things audio. Russ is a member of the Audio Engineering Society and co-founder of the UK Mastering Section there. A former board member of the Music Producers Guild, Russ helped form their Mastering Group. Through MOTTOsound (www.mottosound.co.uk), Russ now works freelance in the industry as a mastering engineer, writer, and consultant. Russ currently lectures part-time for York St John University and has taught extensively in higher education at institutions including Leeds College of Music, London College of Music, and Rose Bruford College. He contributes from time to time in magazines such as MusicTech, Pro Sound News Europe, and Sound on Sound. He has also written many titles for Focal Press and Routledge. Russ is the co-founder of the Innovation in Music conference series (www.musicinnovation.co.uk) and also of the Perspectives on Music Production series of academic books. Jay Hodgson is on faculty at Western University, where he primarily teaches courses on songwriting and project paradigm record production. He is also one of two mastering engineers at MOTTOsound, a boutique audio services house situated in England. In the last few years, Dr. Hodgson's masters have twice been nominated for Juno Awards and topped Beatport's global techno and house charts, and he has contributed music to films recognized by the likes of Rolling Stone magazine and which screened at the United Nations General Assembly. He was awared a Governor General's academic medal in 2006, primarily in recognition of his research on audio recording, and his second book, Understanding Records (2010), was recently acquired by the Reading Room of the Rock and Roll Hall of Fame. He has other books published and forthcoming from Oxford University Press, Bloomsbury, Continuum, Wilfrid Laurier University Press, Focal Press, and Routledge. Mark Marrington trained in composition and musicology at the University of Leeds (MMus, PhD) and is currently a senior lecturer in music production at York St John University. He has previously held teaching positions at Leeds College of Music and the University of Leeds (School of Electronic and Electrical Engineering). Mark has published chapters with Cambridge University Press, Bloomsbury Academic, Routledge, and Future Technology Press and has contributed articles to British Music, Soundboard, the Musical Times, and the Journal on the Art of Record Production. Since 2010, his research has been focused on a range of music production topics with a particular emphasis on the role of digital technologies in music creation and production. Other interests include songwriting, music technology pedagogy, the contemporary classical guitar, and British classical music in the 20th century. His most recent research has been concerned with the aesthetics of classical music recording and a forthcoming monograph on the role of recordings in shaping the identity of the classical guitar in the 20th century. This series, Perspectives on Music Production, collects detailed and experientially informed considerations of record production from a multitude of perspectives, by authors working in a wide array of academic, creative and professional contexts. We solicit the perspectives of scholars of every disciplinary stripe, alongside recordists and recording musicians themselves, to provide a fully comprehensive analytic point-of-view on each component stage of music production. Each volume in the series thus focuses directly on a distinct stage of music production, from pre-production through recording (audio engineering), mixing, mastering, to marketing and promotions.